Nicola Adams is an Olympic speaker whose fantastic smile and brilliant personality are not the only winning things about her. The first female boxer to represent Britain, Nicola is best known for winning a gold medal in flyweight boxing at the 2012 London Olympics. Before that, however, Adams had made her mark around the world, both as an amateur and a professional. At the European Amateur Championships she won a gold medal in 2011 and a silver in 2007; at the World Amateur Championships she won silver medals in 2008, 2010 and 2012; and at the European Union Amateur Championships she won a gold medal in 2011 (repeating the feat two years later). Two years after Nicola won her Olympic gold, she was the champion at the Commonwealth Games in Glasgow – the first female Commonwealth boxing champion – and the following year the Olympic speaker won another gold medal at the European Games… bringing her career medal tally to six golds and four silvers. The fact that Nicola – nicknamed The Baby Faced Assassin – achieved all this after experiencing a serious back injury in 2009 shows how she combines her undeniable talent with sheer determination and grit. Other achievements include – all in 2013 – being voted sportswoman of the year, being awarded an OBE, and topping The Independent on Sunday’s Pink List which recognises ‘inspirational lesbian, gay, bisexual, and transgender ( LGBT ) peers’. She was most recently awarded an OBE in the Queen’s 2017 New Years Honours List and announced her decision to turn pro in January 2017. 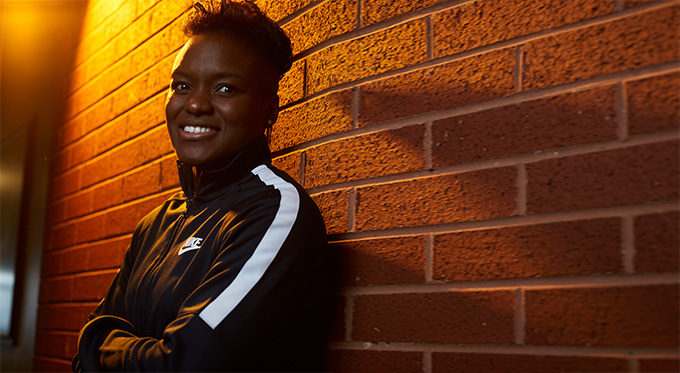 To book Nicola Adams as the Olympic speaker for your corporate event, function or conference, simply contact the Champions Olympic agency by filling in our online contact form. Alternatively, call a booking agent directly on +44 1509 85 29 27.